Cream puffs and I, we go way back. Whenever I had an appointment at Hartford Hospital, my mom would make the event much sweeter (sorry, couldn’t help myself) with a post-visit stop at Modern Pastry. Most of the time, I selected a cream puff so large that it made for two day’s worth of dessert. Great memories — thanks, Mom! 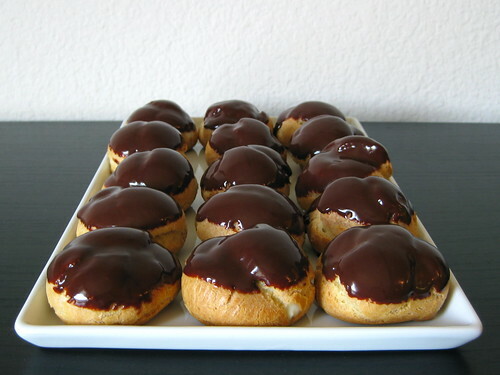 Around the time I turned ten, I found a recipe for “Puffed Explosions” in my oldest kid’s cookbook (My First Baking Book) and from that, started making cream puffs and éclairs at home. The first time I made the pâte à choux, I was petrified intrigued by what happened once the flour was added to the hot water mixture — it was unlike any other batter or dough I had ever made before, so much so that I was absolutely convinced that I made some horrible error. However, they puffed up successfully and I couldn’t have been more proud. Since then, I’ve baked countless batches of pâte à choux, both savory and sweet. However, the perfect pastry cream éclair filling has eluded me — that was, until this past month. Over the Fourth of July week, my sister and her boyfriend came out to visit from Providence. Being an overly-enthusiastic-about-food-even-if-I-can’t-eat-it individual, I made a point to show off some of the best bakeries, restaurants, creameries, etc. all around the Bay Area. In San Francisco, we hit up the Mission District for burritos, pastry and ice cream, all within blocks of one another. Chloe (my sis) indulged in an éclair from Tartine. Once she bit into it and I spotted the unusually pale filling flecked with vanilla bean (ok, and maybe forced asked her to describe it to me and model for a photo…maybe) I knew that I needed to try out the recipe at home. Thankfully, I already own both of their cookbooks —Tartine and Tartine Bread — and they so kindly include the pastry cream recipe in the former. I played around with several adaptations and think you’ll really enjoy the recipe below. The bite-size treats are fantastic for dessert, an afternoon snack or, better-still, with your morning coffee! In a small, heatproof bowl (2 quart), whisk together vanilla sugar and cornstarch. Whisk in egg and egg yolks; set aside. In a small, non-aluminum saucepan over medium heat combine milk, salt and vanilla bean seeds. Whisk constantly until the milk is steaming, and just about ready to simmer. Whisk hot milk in a slow stream into egg mixture. Return milk and egg mix to the saucepan and cook over medium heat, whisking constantly, until it comes to a simmer. (It will thicken enough to coat the back of a spoon, and “snail trails” can be formed in the cream — see this photo). Remove pastry cream from heat, strain through a fine mesh sieve into a clean bowl. Whisk in butter. Place bowl in an ice bath and whisk to cool the pastry cream quickly. Place a sheet of plastic wrap directly on top of cream, cover bowl with another sheet and refrigerate until well-chilled. Break two of the eggs into the paste, beat on medium-high speed until it’s smooth and kind of sticky looking (takes a couple minutes). Break the remaining eggs, one at a time, into the paste, and beat again after each addition until blended (this is what it should look like, it will easily pull away from the paddle). Beat in vanilla extract. Fit a 12″ pastry bag with a Wilton #230 pastry tip (no coupler required). Fill with a third of the cold pastry cream. Puncture the side of an éclair with the pastry tip, fill with cream (just until it feels like the shell is going to burst) and wipe off excess from around the filling hole. Place filled éclairs on a plate and refrigerate once the first pastry bag of cream runs out. Refill pastry bag and repeat filling/refrigerating process. In a small saucepan, warm cream over medium-low heat, stirring occasionally, just until you see a bubble come to the surface. While cream is heating up, place chocolate through salt in a heatproof bowl. Pour hot cream over chocolate and let it sit for a minute; gently stir until the chocolate is melted and the mixture is smooth. 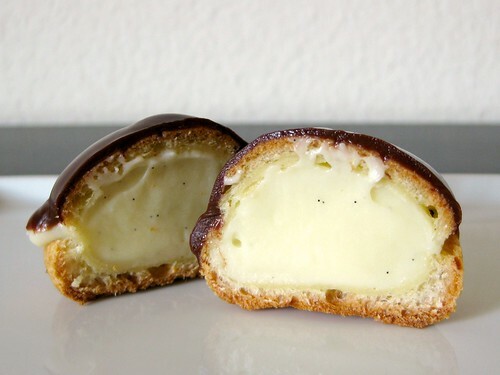 Dip the tops of the filled éclair bites in the ganache, allow excess to drip back into the bowl. Place glazed bites on a clean platter. Allow chocolate to set at room temperature for about 15 minutes before serving or refrigerating. Éclairs are best eaten within several hours of filling. Don’t let the “spent” vanilla bean pods go to waste — make vanilla-scented sugar instead! I really love it in my coffee or to impart a little extra vanilla flavor to baked goods without adding additional moisture in the form of extract. In a glass jar with a tight fitting lid, combine vanilla bean and sugar. Allow vanilla to perfume sugar for at least three days before using, stir daily. Store tightly covered in a cool, dry place. Eclairs are considered a special treat around this house. This is neat that you made them into little bites, great for a dessert tray. Sweet and salty also gets my vote-buzz! I have such fond memories of cream puffs too. My grandmother used to make them and they were so good. I still have no idea how she made them so huge! Or maybe I was so smaller they seemed massive 😀 Yours look so gorgeous – I can’t believe they’re gluten free! WOW! I love how you used millet and garbanzo flour in the flour for the pastry, so cool! thanks for the lovely post, they look divine!